American football is one of the most popular sports in North America. Also known as gridiron, this sport is derived from rugby football, and is played between two teams of eleven players each. In gridiron football, ‘rushing’ is a term used to denote two different actions. It may mean the advancing of the ball by running with it, and is the opposite of passing. It can also mean the defense action of charging towards the quarterback, kicker or punter across the line of scrimmage. On offence, rushing is the action of running with the ball by beginning from behind the line of scrimmage. It may be referred to as a carry. The yards gained during the course of this move are referred to as rushing yards. Let us take a look at the Top 10 American Football Players with 10,000 Rushing Yards. American football player Marshall Faulk completed a total of 12,279 rushing yards in his active footballing career from 1994 to 2005, and is inducted in the tenth place in our list of top 10 American football players with 10,000 rushing yards. He played for the Indianapolis Colts between 1994 and 1998, and also played for the St. Louis Rams from 1999 to 2005 in his active American football career. Marshall Faulk gained a total of 12,279 rushing yards and has achieved a total of 2,836 carries in his professional career. He has astonishing overall yards per carry average of 4.3 in his professional American football legacy. Marshall Faulk was inducted into the Pro Football Hall of Fame in 2011. American football player Jim Brown completed a total of 12,312 rushing yards in his active footballing career from 1957 to 1965, and is inducted in the ninth place in our list of top 10 American football players with 10,000 rushing yards. He played for the Cleveland Browns between 1957 and 1965 in his active American football career. 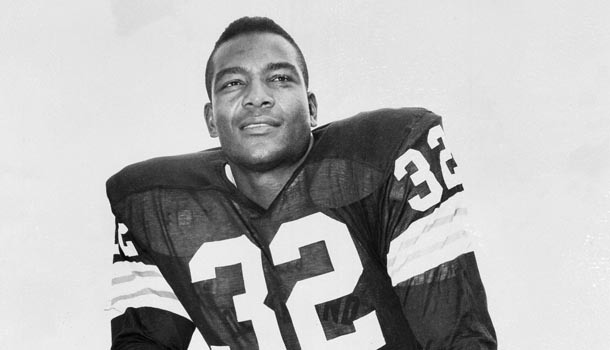 Jim Brown gained a total of 12,312 rushing yards and has achieved a total of 2,359 carries in his professional career. He has astonishing overall yards per carry average of 5.2 in his professional American football legacy. Jim Brown was inducted into the Pro Football Hall of Fame in 1971. 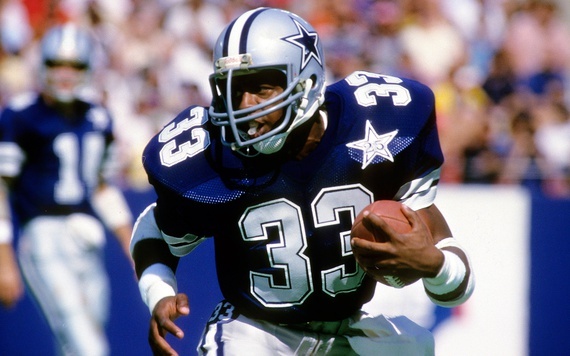 American football player Tony Dorsett completed a total of 12,739 rushing yards in his active footballing career from 1977 to 1988, and is inducted in the eighth place in our list of top 10 American football players with 10,000 rushing yards. He played for the Dallas Cowboys between 1977 and 1987, and also played for the Denver Broncos in 1988 football season in his active American football career. Tony Dorsett gained a total of 12,739 rushing yards and has achieved a total of 2,936 carries in his professional career. He has astonishing overall yards per carry average of 4.3 in his professional American football legacy. Tony Dorsett was inducted into the Pro Football Hall of Fame in 1994. American football player Eric Dickerson completed a total of 13,259 rushing yards in his active footballing career from 1983 to 1993, and is inducted in the seventh place in our list of top 10 American football players with 10,000 rushing yards. He played for the Los Angeles Rams between 1983 and 1987, played for the Indianapolis Colts from 1987 to 1991, as well as the Los Angeles Raiders in 1992 and Atlanta Falcons in 1993 in his active American football career. 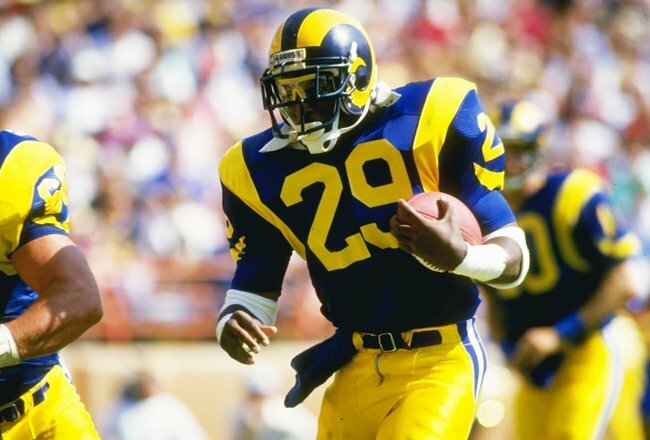 Eric Dickerson gained a total of 13,259 rushing yards and has achieved a total of 2,996 carries in his professional career. He has astonishing overall yards per carry average of 4.4 in his professional American football legacy. Eric Dickerson was inducted into the Pro Football Hall of Fame in 1999. American football player Jerome Bettis completed a total of 13,662 rushing yards in his active footballing career from 1993 to 2005, and is inducted in the sixth place in our list of top 10 American football players with 10,000 rushing yards. 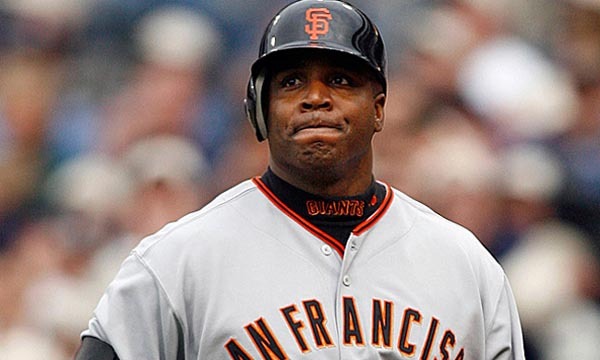 He played for the Los Angeles Rams between 1993 and 1995, and also played for the Pittsburgh Steelers from 1996 to 2005 in his active American football career. 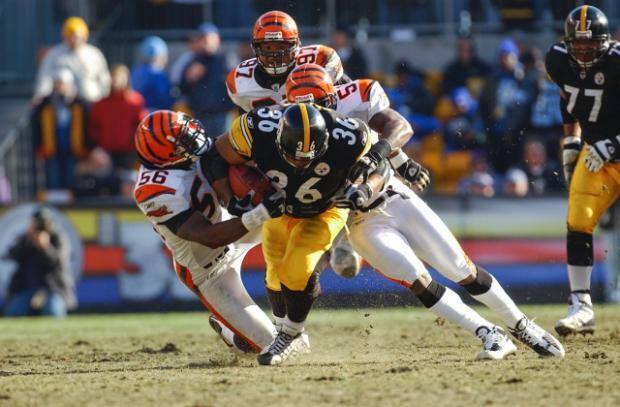 Jerome Bettis gained a total of 13,662 rushing yards and has achieved a total of 3,479 carries in his professional career. He has astonishing overall yards per carry average of 3.9 in his professional American football legacy. Jerome Bettis was inducted into the Pro Football Hall of Fame in 2015. American football player LaDainian Tomlinson completed a total of 13,684 rushing yards in his active footballing career from 2001 to 2011, and is inducted in the fifth place in our list of top 10 American football players with 10,000 rushing yards. He played for the San Diego Chargers between 2001 and 2009, and also played for the New York Jets from 2010 to 2011 in his active American football career. LaDainian Tomlinson gained a total of 13,684 rushing yards and has achieved a total of 3,174 carries in his professional career. He has astonishing overall yards per carry average of 4.3 in his professional American football legacy. 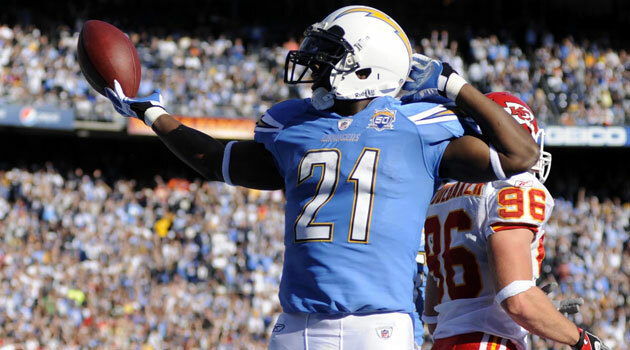 LaDainian Tomlinson will be eligible to be inducted into the Pro Football Hall of Fame in 2017. 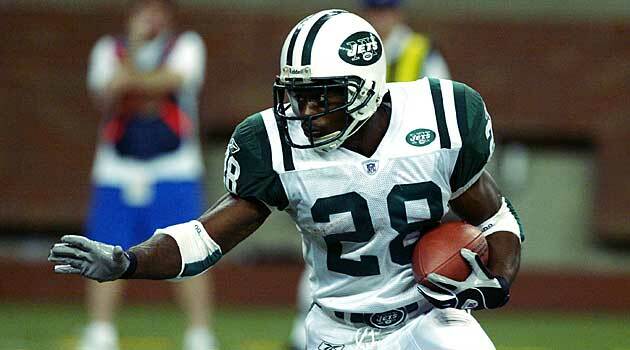 American football player Curtis Martin completed a total of 14,101 rushing yards in his active footballing career from 1995 to 2005, and is inducted in the fourth place in our list of top 10 American football players with 10,000 rushing yards. He played for New England Patriots between 1995 and 1997, and also played for the New York Jets from 1998 to 2005 in his active American football career. Curtis Martin gained a total of 14,101 rushing yards and has achieved a total of 3,518 carries in his professional career. He has astonishing overall yards per carry average of 4.0 in his professional American football legacy. Curtis Martin was inducted into the Pro Football Hall of Fame in 2012. American football player Barry Sanders completed a total of 15,269 rushing yards in his active footballing career from 1989 to 1998, and is inducted in the third place in our list of top 10 American football players with 10,000 rushing yards. He played for the Detroit Lions between 1989 and 1998 in his active American football career. 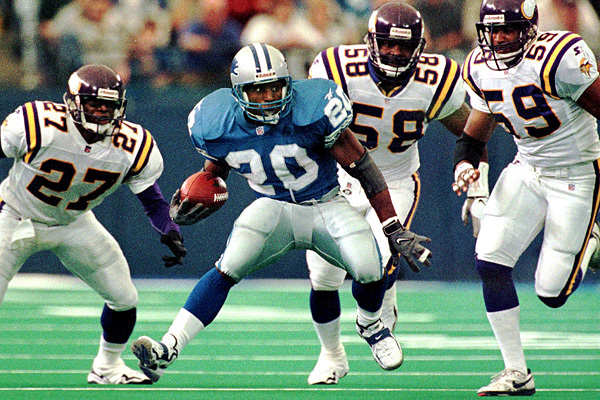 Barry Sanders gained a total of 15,269 rushing yards and has achieved a total of 3,062 carries in his professional career. He has astonishing overall yards per carry average of 5.0 in his professional American football legacy. Barry Sanders was inducted into the Pro Football Hall of Fame in 2004. American football player Walter Payton completed a total of 16,726 rushing yards in his active footballing career from 1975 to 1987, and is inducted in the second place in our list of top 10 American football players with 10,000 rushing yards. He played for the Chicago Bears between 1975 and 1987 in his active American football career. 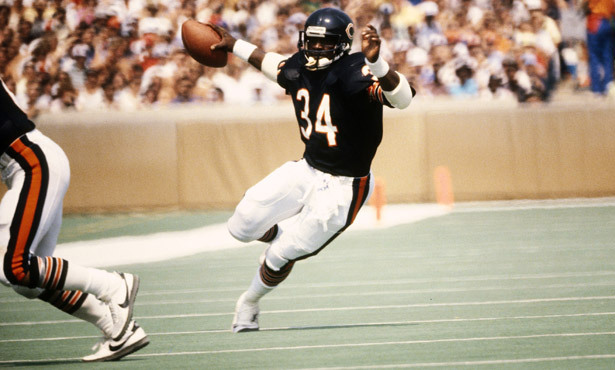 Walter Payton gained a total of 16,726 rushing yards and has achieved a total of 3,838 carries in his professional career. He has astonishing overall yards per carry average of 4.4 in his professional American football legacy. Walter Payton was inducted into the Pro Football Hall of Fame in 1993. American football player Emmitt Smith completed a total of 18,355 rushing yards in his active footballing career from 1990 to 2004, and is inducted in the top place in our list of top 10 American football players with 10,000 rushing yards. He played for the Dallas Cowboys between 1990 and 2002, and also played for the Arizona Cardinals from 2003 to 2004 in his active American football career. 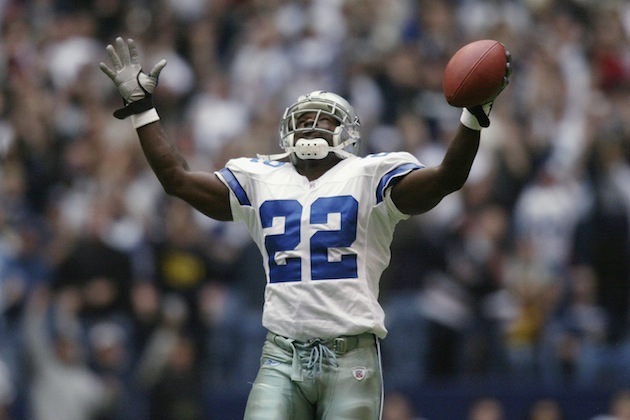 Emmitt Smith gained a total of 18,355 rushing yards and has achieved a total of 4,409 carries in his professional career. He has astonishing overall yards per carry average of 4.2 in his professional American football legacy. Emmitt Smith was inducted into the Pro Football Hall of Fame in 2010. There are very few records in the history of sports, and not just American football, which are as treasured as the 10,000 yards. 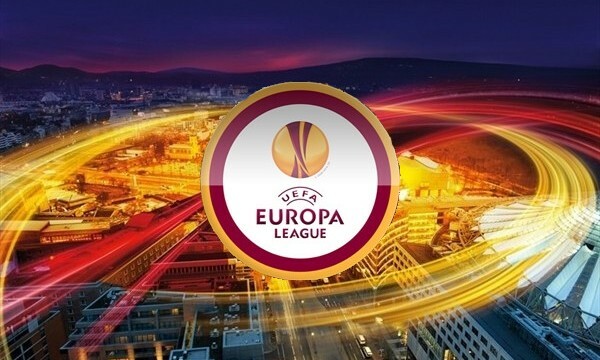 That is why the players who have achieved this record are treated with great respect and celebration. 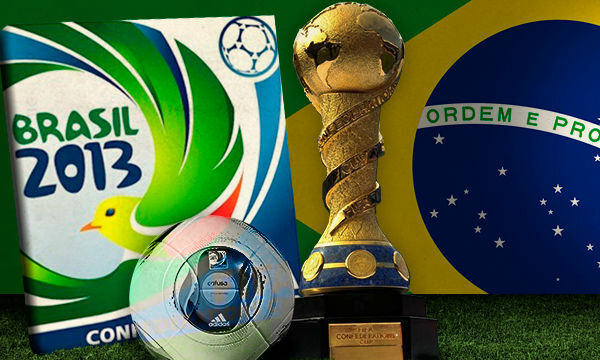 Players who play this sport consider these records their targets.